This week we did many activities involving solids. We sorted solids, explored whether or not they roll, stack or slide, investigated the strongest ones for building, and did puzzles involving building shapes using a set number of triangles, squares, trapezoids, rhombus, rectangles and hexagons. They also searched for shapes and solids in magazines. The children worked diligently in their journals and are learning which words require capitals. They are doing an excellent job at quiet reading time focussing on books that are at their level for reading. We learned all about igloos and are looking forward to building some. We talked about how climate affects the materials used in building homes. We would love it if you could send in a picture of your house or email it to us. In Music, the SKs continue to explore beat and rhythm with rhythm sticks following patterns in songs and also by using egg shakers in the song Pass Around the Easter Egg. We read and sang the picture book We’ve Got the Whole World in Our Hands. This week in Art, the SKs continued to be architects and began to make a plan/sketch of a building design for 100 years in the future. Students used shapes to draw their building design. Next week, they will begin to build a model of their building using different materials. In French, the students have learned a new song called, Dans ma chambre (In my room). It ties in beautifully with our play, Boucles d’or et les trois ours, where we speak about the home in French. Please follow the link below to view the song. This week in PHE, the SK’s finished off the balance unit. Next week they will look into healthy food choices through active movement and games. A gentle reminder that all student absences should be emailed to 1639attendance@yorkschool.com As well, if your child arrives late, please have them sign in with Ms. Kate or reception. Please continue to pack appropriately for the weather- splash pants, mitts etc. as the temperature is still not consistently warm. We also need extra clothes at school- socks, pants and underwear. On Friday May 3rd, we will be going on a field trip to Treetop Trekking. We need everyone to fill out a waiver for the trip. We will be sending it in a separate email. 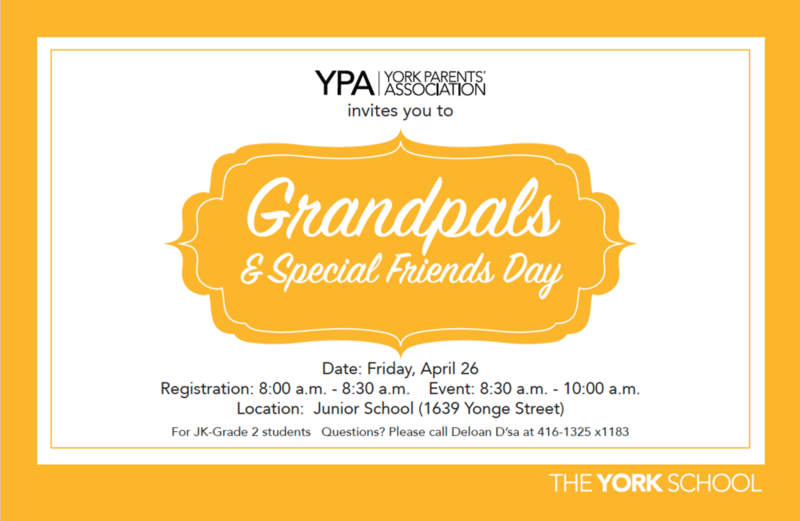 Join us for a special morning at the Primary school! To rsvp, click here.